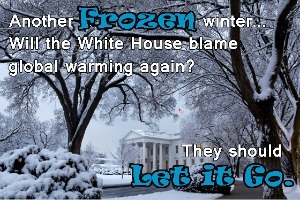 A year ago this week, in the midst of another brutally cold winter, the White House graced us with an explanation of how man-made global warming might be causing freezing temperatures in a video about the polar vortex. 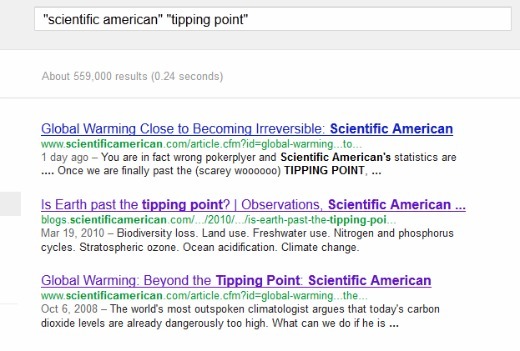 The video was widely covered in the press, but it was criticized by climate scientists on all sides of the global warming debate. Yes, there was a “growing body of evidence” on the topic, but it was growing in the other direction—that is, newer studies contradicted any connection between warming and winter cold waves. Today is the close of briefing in our appeal of Michael Mann’s defamation suit against the Competitive Enterprise Insitute, CEI adjunct Rand Simberg, National Review and Mark Steyn. Some background information and the court filings can be found here. We’re appealing a lower court’s refusal to dismiss this case under the District of Columbia’s anti-SLAPP statute, which protects participants in public debate from being silenced by meritless lawsuits. Groups ranging from the Reporters Committee for Freedom of the Press and the ACLU to the Cato Institute and the Electronic Frontier Foundation view Mann’s suit as being exactly that—meritless—and they make this clear in the amicus briefs they filed in our support. In short, EPA didn’t exonerate Mann, but it may well have exonerated the defendants. Back on June 6th, OSTP (the White House Office of Science and Technology Policy) officially declined to reexamine its highly-publicized January explanation for the extremely cold winter. According to that video, The Polar Vortex Explained In 2 Minutes, the likely culprit was global warming; this was supposedly demonstrated, in Director John Holdren’s words, by “a growing body of evidence”. In a Data Quality correction petition that we filed with OSTP in April, we pointed out that the body of evidence supporting Holdren was in fact shrinking, not growing. (In fact, it shrank even more earlier this week, when yet another contrary study came out.) But OSTP ducked the issue, claiming that its Director had only been expressing his “personal opinion”, and that therefore the Data Quality Act didn’t apply. Note that the video is posted on the White House youtube channel and has been touted by other OSTP staff. OSTP never corrected any of the many reporters who interpreted it as being the White House line. If Holdren’s mere “personal opinion” was dressed up in this much official garb, then how much more formality would have accompanied an “official” statement? Would herald angels have burst into song? That’s right, OSTP. If you’re serious about this being your Director’s personal opinion, then put a fat red rubber-stamped disclaimer saying that on the video. Better yet, take the video off your website before some government auditor asks why agency resources are being used to promote personal opinions. You’ve got wonder whether global warming is affecting these people’s judgment. 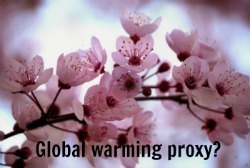 Will Cherry Blossoms Get Sucked into the Polar Vortex? The past two years of unusually late blooms largely resulted from unusually cold weather. But unusually cold weather, in the view of White House Science Advisor John Holdren, is actually yet another sign of global warming. Holdren explained this to a freezing yet grateful nation in a two-minute video last January entitled The Polar Vortex Explained in 2 Minutes. We suspect that Holdren’s agency, the Office of Science and Technology Policy (OSTP), may now have a second video in the works in this Blame-Everything-On-Global-Warming series. Perhaps they’ll call it Delayed Peak Blossoming Explained in 2 Minutes. Regardless, we think Holdren’s first video is scientifically bogus, and so today we’re filing a formal Information Quality Act Correction Request with OSTP on that very issue. Who knows—we may yet nip this video series in the bud. 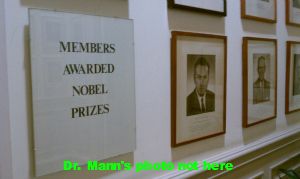 Try as I might, I simply could not find his photo. I wonder why. Maybe he’s not a Cosmos Club member. The notion of $2.50 gasoline would not only be a “veritable policy revolution” domestically (“Newt Is Right About Gas Prices” by Holman W. Jenkins, Jr., Business World, March 10), it would be a gutsy display of American exceptionalism for the rest of the world. This is not because Americans are divinely entitled to federally subsidized fuel (they’re not), but because they do have a right to gas prices that aren’t artificially jacked up by government drilling restrictions and taxes. Americans aren’t the only ones. As booming car ownership in India and China demonstrates, automobility satisfies some pretty basic human needs and desires. Unfortunately for central planners around the world, there’s nothing worse than a technology that lets people go where they want to, when they want to. For an American leader of whatever party to take the lead in shedding gasoline’s sin-product status would be downright revolutionary. In the early 1800s, as railroads spread across Britain, the Duke of Wellington supposedly sneered that trains would “only encourage the common people to move about needlessly.” Aristocrats could always move about; only when the rest of us were able to do so did this become a so-called problem. A decade ago our aristocrats looked down on SUVs; today they look down on affordable gas. Either way, their attitudes toward mobility are no different than the Duke’s views two centuries ago, and no less backward. 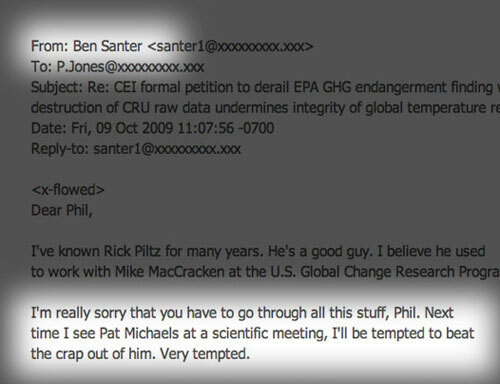 As my colleague Myron Ebell reported earlier this week, Joe Romm pulled out of a scheduled debate on climate policy last Friday with the Heritage Foundation’s David Kreutzer. Given the last-minute nature of Romm’s cancellation, the host of the debate initially used a bottle of Corona Light to symbolically take Romm’s place at the podium. I thought the beer bottle was a poor substitute, and replaced it with a plate of ice cubes. 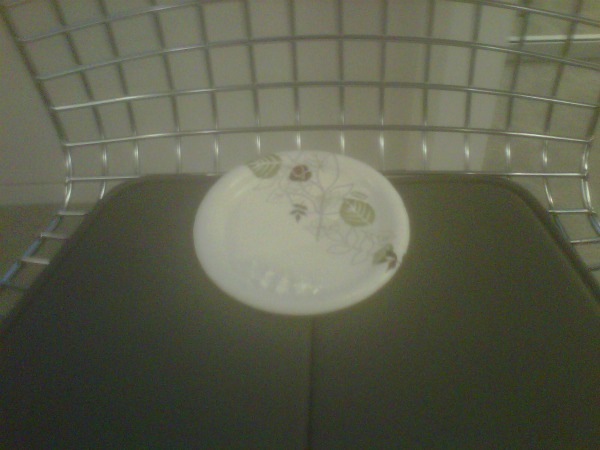 As the photo below shows, by the end of the event the ice cubes had undergone significant melting. There was, however, no suggestion that anthropogenic warming was the cause. On the other hand, I’m not sure there were any climate modelers in attendance.